The Spine Runtimes are available for many programming languages. To simplify documentation, the API reference below is programming language agnostic. There may be minor differences for some languages, such as start caps for spine-csharp and class name prefixes on methods for spine-c.
Parameters cannot be null unless explicitly mentioned. Returns values will not be null unless explicitly mentioned. This diagram illustrates how the various pieces of the runtimes fit together. Click for full resolution. A simple container for a list of timelines and a name. The duration of the animation in seconds, which is the highest time of all keys in the timeline. The animation's name, which is unique within the skeleton. Applies all the animation's timelines to the specified skeleton. loop If true, the animation repeats after duration. The interface for all timelines. Uniquely encodes both the type of this timeline and the skeleton property that it affects. Applies this timeline to the skeleton. skeleton The skeleton the timeline is being applied to. This provides access to the bones, slots, and other skeleton components the timeline may change. lastTime The time this timeline was last applied. Timelines such as EventTimeline trigger only at specific times rather than every frame. In that case, the timeline triggers everything between lastTime (exclusive) and time (inclusive). time The time within the animation. Most timelines find the key before and the key after this time so they can interpolate between the keys. events If any events are fired, they are added to this list. Can be null to ignore firing events or if the timeline does not fire events. alpha 0 applies the current or setup value (depending on blend). 1 applies the timeline value. Between 0 and 1 applies a value between the current or setup value and the timeline value. By adjusting alpha over time, an animation can be mixed in or out. alpha can also be useful to apply animations on top of each other (layered). blend Controls how mixing is applied when alpha < 1.
direction Indicates whether the timeline is mixing in or out. Used by timelines which perform instant transitions, such as DrawOrderTimeline or AttachmentTimeline. The attachment name for each key frame. May contain null values to clear the attachment. The number of key frames for this timeline. The time in seconds for each key frame. The index of the slot in slots that will be changed. Sets the time in seconds and the attachment name for the specified key frame. An interface for timelines which change the property of a bone. The index of the bone in bones that will be changed. The time in seconds, red, green, blue, and alpha values for each key frame. Returns the interpolated percentage for the specified key frame and linear percentage. Returns the interpolation type for the specified key frame. <return value> Linear is 0, stepped is 1, Bezier is 2. Sets the specified key frame to Bezier interpolation. cx1 and cx2 are from 0 to 1, representing the percent of time between the two key frames. cy1 and cy2 are the percent of the difference between the key frame's values. Sets the time in seconds, red, green, blue, and alpha for the specified key frame. Sets the specified key frame to linear interpolation. Sets the specified key frame to stepped interpolation. The base class for timelines that use interpolation between key frame values. Changes a slot's attachmentVertices to deform a VertexAttachment. The attachment that will be deformed. The vertices for each key frame. Sets the time in seconds and the vertices for the specified key frame. vertices Vertex positions for an unweighted VertexAttachment, or deform offsets if it has weights. The draw order for each key frame. See setFrame. Sets the time in seconds and the draw order for the specified key frame. drawOrder For each slot in slots, the index of the new draw order. May be null to use setup pose draw order. Fires an Event when specific animation times are reached. The event for each key frame. Fires events for frames > lastTime and <= time. Sets the time in seconds and the event for the specified key frame. Changes an IK constraint's mix, bendDirection, stretch, and compress. The time in seconds, mix, bend direction, compress, and stretch for each key frame. The index of the IK constraint slot in ikConstraints that will be changed. Sets the time in seconds, mix, bend direction, compress, and stretch for the specified key frame. Changes a path constraint's mixes. The time in seconds, rotate mix, and translate mix for each key frame. The index of the path constraint slot in pathConstraints that will be changed. The time in seconds, rotate mix, and translate mix for the specified key frame. Changes a path constraint's position. The time in seconds and path constraint position for each key frame. Sets the time in seconds and path constraint position for the specified key frame. Changes a path constraint's spacing. Changes a bone's local rotation. The time in seconds and rotation in degrees for each key frame. Sets the time in seconds and the rotation in degrees for the specified key frame. Changes a bone's local scaleX and scaleY. The time in seconds, x, and y values for each key frame. Sets the time in seconds, x, and y values for the specified key frame. Changes a bone's local shearX and shearY. An interface for timelines which change the property of a slot. Changes a transform constraint's mixes. The time in seconds, rotate mix, translate mix, scale mix, and shear mix for each key frame. The index of the transform constraint slot in transformConstraints that will be changed. The time in seconds, rotate mix, translate mix, scale mix, and shear mix for the specified key frame. Changes a bone's local x and y. Changes a slot's color and darkColor for two color tinting. Sets the time in seconds, light, and dark colors for the specified key frame. Controls how a timeline value is mixed with the setup pose value or current pose value. Transitions from the setup value to the timeline value (the current value is not used). Before the first key, the setup value is set. Transitions from the current value to the timeline value. Before the first key, transitions from the current value to the setup value. Timelines which perform instant transitions, such as DrawOrderTimeline or AttachmentTimeline, use the setup value before the first key. first is intended for the first animations applied, not for animations layered on top of those. Transitions from the current value to the timeline value. No change is made before the first key (the current value is kept until the first key). replace is intended for animations layered on top of others, not for the first animations applied. Transitions from the current value to the current value plus the timeline value. No change is made before the first key (the current value is kept until the first key). add is intended for animations layered on top of others, not for the first animations applied. Indicates whether a timeline's alpha is mixing out over time toward 0 (the setup or current pose value) or mixing in toward 1 (the timeline's value). Applies animations over time, queues animations for later playback, mixes (crossfading) between animations, and applies multiple animations on top of each other (layering). See Applying Animations in the Spine Runtimes Guide. The AnimationStateData to look up mix durations. Multiplier for the delta time when the animation state is updated, causing time for all animations and mixes to play slower or faster. Defaults to 1. See TrackEntry timeScale for affecting a single animation. The list of tracks that currently have animations, which may contain null entries. Queues an animation by name. Adds an animation to be played after the current or last queued animation for a track. If the track is empty, it is equivalent to calling setAnimation. delay If > 0, sets delay. If <= 0, the delay set is the duration of the previous track entry minus any mix duration (from the AnimationStateData) plus the specified delay (ie the mix ends at (delay = 0) or before (delay < 0) the previous track entry duration). If the previous entry is looping, its next loop completion is used instead of its duration. <return value> A track entry to allow further customization of animation playback. References to the track entry must not be kept after the dispose event occurs. Adds an empty animation to be played after the current or last queued animation for a track, and sets the track entry's mixDuration. If the track is empty, it is equivalent to calling setEmptyAnimation. delay If > 0, sets delay. If <= 0, the delay set is the duration of the previous track entry minus any mix duration plus the specified delay (ie the mix ends at (delay = 0) or before (delay < 0) the previous track entry duration). If the previous entry is looping, its next loop completion is used instead of its duration. Adds a listener to receive events for all track entries. Poses the skeleton using the track entry animations. There are no side effects other than invoking listeners, so the animation state can be applied to multiple skeletons to pose them identically. <return value> True if any animations were applied. Discards all listener notifications that have not yet been delivered. This can be useful to call from an AnimationStateListener when it is known that further notifications that may have been already queued for delivery are not wanted because new animations are being set. Removes all listeners added with addListener. Removes all animations from the track, leaving skeletons in their current pose. It may be desired to use setEmptyAnimation to mix the skeletons back to the setup pose, rather than leaving them in their current pose. Removes all animations from all tracks, leaving skeletons in their current pose. It may be desired to use setEmptyAnimations to mix the skeletons back to the setup pose, rather than leaving them in their current pose. Returns the track entry for the animation currently playing on the track, or null if no animation is currently playing. Removes the listener added with addListener. Sets an animation by name. Sets the current animation for a track, discarding any queued animations. If the formerly current track entry was never applied to a skeleton, it is replaced (not mixed from). loop If true, the animation will repeat. If false it will not, instead its last frame is applied if played beyond its duration. In either case trackEnd determines when the track is cleared. Sets an empty animation for a track, discarding any queued animations, and sets the track entry's mixDuration. An empty animation has no timelines and serves as a placeholder for mixing in or out. Mixing out is done by setting an empty animation with a mix duration using either setEmptyAnimation, setEmptyAnimations, or addEmptyAnimation. Mixing to an empty animation causes the previous animation to be applied less and less over the mix duration. Properties keyed in the previous animation transition to the value from lower tracks or to the setup pose value if no lower tracks key the property. A mix duration of 0 still mixes out over one frame. Mixing in is done by first setting an empty animation, then adding an animation using addAnimation and on the returned track entry, set the mixDuration. Mixing from an empty animation causes the new animation to be applied more and more over the mix duration. Properties keyed in the new animation transition from the value from lower tracks or from the setup pose value if no lower tracks key the property to the value keyed in the new animation. Sets an empty animation for every track, discarding any queued animations, and mixes to it over the specified mix duration. Increments each track entry trackTime, setting queued animations as current if needed. Stores mix (crossfade) durations to be applied when AnimationState animations are changed. The mix duration to use when no mix duration has been defined between two animations. The SkeletonData to look up animations when they are specified by name. Returns the mix duration to use when changing from the specified animation to the other, or the defaultMix if no mix duration has been set. Sets the mix duration when changing from the specified animation to the other. Sets a mix duration by animation name. The interface to implement for receiving TrackEntry events. It is always safe to call AnimationState methods when receiving events. See TrackEntry listener and AnimationState addListener. Invoked every time this entry's animation completes a loop. Because this event is trigged in apply, any animations set in response to the event won't be applied until the next time the AnimationState is applied. Invoked when this entry will be disposed. This may occur without the entry ever being set as the current entry. References to the entry should not be kept after dispose is called, as it may be destroyed or reused. Invoked when this entry is no longer the current entry and will never be applied again. Invoked when this entry's animation triggers an event. Because this event is trigged in apply, any animations set in response to the event won't be applied until the next time the AnimationState is applied. Invoked when another entry has replaced this entry as the current entry. This entry may continue being applied for mixing. Invoked when this entry has been set as the current entry. Stores settings and other state for the playback of an animation on an AnimationState track. References to a track entry must not be kept after the dispose event occurs. Values < 1 mix this animation with the skeleton's current pose (usually the pose resulting from lower tracks). Defaults to 1, which overwrites the skeleton's current pose with this animation. Typically track 0 is used to completely pose the skeleton, then alpha is used on higher tracks. It doesn't make sense to use alpha on track 0 if the skeleton pose is from the last frame render. The animation to apply for this track entry. Seconds for the last frame of this animation. Non-looping animations won't play past this time. Looping animations will loop back to animationStart at this time. Defaults to the animation duration. The time in seconds this animation was last applied. Some timelines use this for one-time triggers. Eg, when this animation is applied, event timelines will fire all events between the animationLast time (exclusive) and animationTime (inclusive). Defaults to -1 to ensure triggers on frame 0 happen the first time this animation is applied. Seconds when this animation starts, both initially and after looping. Defaults to 0. When changing the animationStart time, it often makes sense to set animationLast to the same value to prevent timeline keys before the start time from triggering. Uses trackTime to compute the animationTime, which is between animationStart and animationEnd. When the trackTime is 0, the animationTime is equal to the animationStart time. When the mix percentage (mixTime / mixDuration) is less than the attachmentThreshold, attachment timelines are applied while this animation is being mixed out. Defaults to 0, so attachment timelines are not applied while this animation is being mixed out. Seconds to postpone playing the animation. When this track entry is the current track entry, delay postpones incrementing the trackTime. When this track entry is queued, delay is the time from the start of the previous animation to when this track entry will become the current track entry (ie when the previous track entry trackTime >= this track entry's delay). When the mix percentage (mixTime / mixDuration) is less than the drawOrderThreshold, draw order timelines are applied while this animation is being mixed out. Defaults to 0, so draw order timelines are not applied while this animation is being mixed out. When the mix percentage (mixTime / mixDuration) is less than the eventThreshold, event timelines are applied while this animation is being mixed out. Defaults to 0, so event timelines are not applied while this animation is being mixed out. If true, when mixing from the previous animation to this animation, the previous animation is applied as normal instead of being mixed out. When mixing between animations that key the same property, if a lower track also keys that property then the value will briefly dip toward the lower track value during the mix. This happens because the first animation mixes from 100% to 0% while the second animation mixes from 0% to 100%. Setting holdPrevious to true applies the first animation at 100% during the mix so the lower track value is overwritten. Such dipping does not occur on the lowest track which keys the property, only when a higher track also keys the property. Snapping will occur if holdPrevious is true and this animation does not key all the same properties as the previous animation. The listener for events generated by this track entry, or null. A track entry returned from setAnimation is already the current animation for the track, so the track entry listener start will not be called. If true, the animation will repeat. If false it will not, instead its last frame is applied if played beyond its duration. Controls how properties keyed in the animation are mixed with lower tracks. Defaults to replace, which replaces the values from the lower tracks with the animation values. add adds the animation values to the values from the lower tracks. The mixBlend can be set for a new track entry only before apply is first called. Seconds for mixing from the previous animation to this animation. Defaults to the value provided by AnimationStateData getMix based on the animation before this animation (if any). The mixDuration can be set manually rather than use the value from getMix. In that case, the mixDuration can be set for a new track entry only before update is first called. When using addAnimation with a delay <= 0, note the delay is set using the mix duration from the AnimationStateData, not a mix duration set afterward. Seconds from 0 to the mixDuration when mixing from the previous animation to this animation. May be slightly more than mixDuration when the mix is complete. The track entry for the previous animation when mixing from the previous animation to this animation, or null if no mixing is currently occuring. When mixing from multiple animations, mixingFrom makes up a linked list. The track entry for the next animation when mixing from this animation to the next animation, or null if no mixing is currently occuring. When mixing to multiple animations, mixingTo makes up a linked list. The animation queued to start after this animation, or null. next makes up a linked list. Multiplier for the delta time when this track entry is updated, causing time for this animation to pass slower or faster. Defaults to 1.
mixTime is not affected by track entry time scale, so mixDuration may need to be adjusted to match the animation speed. When using addAnimation with a delay <= 0, note the delay is set using the mix duration from the AnimationStateData, assuming time scale to be 1. If the time scale is not 1, the delay may need to be adjusted. See AnimationState timeScale for affecting all animations. The track time in seconds when this animation will be removed from the track. Defaults to the highest possible float value, meaning the animation will be applied until a new animation is set or the track is cleared. If the track end time is reached, no other animations are queued for playback, and mixing from any previous animations is complete, then the properties keyed by the animation are set to the setup pose and the track is cleared. It may be desired to use addEmptyAnimation rather than have the animation abruptly cease being applied. The index of the track where this track entry is either current or queued. Current time in seconds this track entry has been the current track entry. The track time determines animationTime. The track time can be set to start the animation at a time other than 0, without affecting looping. Returns true if at least one loop has been completed. Resets the rotation directions for mixing this entry's rotate timelines. This can be useful to avoid bones rotating the long way around when using alpha and starting animations on other tracks. Mixing with replace involves finding a rotation between two others, which has two possible solutions: the short way or the long way around. The two rotations likely change over time, so which direction is the short or long way also changes. If the short way was always chosen, bones would flip to the other side when that direction became the long way. TrackEntry chooses the short way the first time it is applied and remembers that direction. Stores information about texture regions in one or more texture pages. Creating an atlas takes the atlas data file and a TextureLoader. An atlas page for each texture. The atlas regions across all pages. Uses the TextureLoader to unload each AtlasPage rendererObject. Returns the first region found with the specified name, or null if it was not found. String comparison is used to find the region so the result should be cached rather than calling this method multiple times. Settings for an atlas backing texture. The memory format to use for the texture. The height in pixels of the image file. The name of the image file for the texture. A game toolkit specific object used by rendering code, usually set by a TextureLoader. The X axis texture wrap setting. The Y axis texture wrap setting. The width in pixels of the image file. A texture region on an atlas page. The height in pixels of the unrotated texture region after whitepace stripping. The number at the end of the original image file name, or -1 if none. When sprites are packed, if the original file name ends with a number, it is stored as the index and is not considered as part of the region's name. This is useful for keeping animation frames in order. Pixels stripped from the left of the unrotated texture region. Pixels stripped from the bottom of the unrotated texture region. The height in pixels of the unrotated texture region before whitespace stripping. The width in pixels of the unrotated texture region before whitespace stripping. The ninepatch padding, or null if not a ninepatch or the ninepatch has no padding. Has 4 entries: left, right, top, bottom. The atlas page this region belongs to. If true, the texture region is stored in the atlas rotated 90 degrees counterclockwise. The ninepatch splits, or null if not a ninepatch. Has 4 entries: left, right, top, bottom. The normalized (0-1) texture coordinate of the left edge of the texture region. The normalized (0-1) texture coordinate of the right edge of the texture region. The normalized (0-1) texture coordinate of the top edge of the texture region. The normalized (0-1) texture coordinate of the bottom edge of the texture region. The width in pixels of the unrotated texture region after whitespace stripping. Pixels from the left edge of the texture to the left edge of the texture region. Pixels from the bottom edge of the texture to the bottom edge of the texture region. The memory format to use when loading an image into the AtlasPage texture. The filtering for magnification or minification of the AtlasPage texture. The interface which can be implemented to customize loading of AtlasPage images for an Atlas. Loads a texture using the AtlasPage name or the image at the specified path and sets the AtlasPage rendererObject. Unloads the rendererObject previously loaded in load. The texture wrapping mode for UVs outside the AtlasPage texture. The base class for all attachments. An attachment with vertices that make up a polygon. Can be used for hit detection, creating physics bodies, spawning particle effects, and more. See SkeletonBounds and Bounding Boxes in the Spine User Guide. The bones which affect the vertices. The array entries are, for each vertex, the number of bones affecting the vertex followed by that many bone indices, which is the index of the bone in bones. Will be null if this attachment has no weights. The color of the bounding box as it was in Spine. Available only when nonessential data was exported. Bounding boxes are not usually rendered at runtime. Returns a unique ID for this attachment. The vertex positions in the bone's coordinate system. For a non-weighted attachment, the values are x,y entries for each vertex. For a weighted attachment, the values are x,y,weight entries for each bone affecting each vertex. The maximum number of world vertex values that can be output by computeWorldVertices using the count parameter. Returns true if a deform originally applied to the specified attachment should be applied to this attachment. The default implementation returns true only when sourceAttachment is this attachment. Transforms the attachment's local vertices to world coordinates. If the slot has attachmentVertices, they are used to deform the vertices. See World transforms in the Spine Runtimes Guide. An attachment with vertices that make up a polygon used for clipping the rendering of other attachments. The color of the clipping polygon as it was in Spine. Available only when nonessential data was exported. Clipping polygons are not usually rendered at runtime. Clipping is performed between the clipping polygon's slot and the end slot. Returns -1 if clipping is done until the end of the skeleton's rendering. An attachment that displays a textured mesh. A mesh has hull vertices and internal vertices within the hull. Holes are not supported. Each vertex has UVs (texture coordinates) and triangles are used to map an image on to the mesh. See Mesh attachments in the Spine User Guide. The color to tint the mesh. Vertex index pairs describing edges for controling triangulation. Mesh triangles will never cross edges. Only available if nonessential data was exported. Triangulation is not performed at runtime. The height of the mesh's image. Available only when nonessential data was exported. The number of entries at the beginning of vertices that make up the mesh hull. When this is a linked mesh (see parentMesh), if true, any DeformTimeline for the parentMesh is also applied to this mesh. If false, this linked mesh may have its own deform timelines. The parent mesh if this is a linked mesh, else null. A linked mesh shares the bones, vertices, regionUVs, triangles, hullLength, edges, width, and height with the parent mesh, but may have a different name or path (and therefore a different texture). The name of the texture region for this attachment. The UV pair for each vertex, normalized within the texture region. A game toolkit specific object used by rendering code, usually set by an AttachmentLoader. Triplets of vertex indices which describe the mesh's triangulation. The UV pair for each vertex, normalized within the entire texture. The width of the mesh's image. Available only when nonessential data was exported. Returns true if the sourceAttachment is this mesh, else returns true if inheritDeform is true and the the sourceAttachment is the parentMesh. Calculates the uvs using the regionUVs and other region settings. Must be called after changing region settings. An attachment whose vertices make up a composite Bezier curve. See PathConstraint and Paths in the Spine User Guide. If true, the start and end knots are connected. The color of the path as it was in Spine. Available only when nonessential data was exported. Paths are not usually rendered at runtime. If true, additional calculations are performed to make calculating positions along the path more accurate. If false, fewer calculations are performed but calculating positions along the path is less accurate. The lengths along the path in the setup pose from the start of the path to the end of each Bezier curve. An attachment which is a single point and a rotation. This can be used to spawn projectiles, particles, etc. A bone can be used in similar ways, but a PointAttachment is slightly less expensive to compute and can be hidden, shown, and placed in a skin. See Point Attachments in the Spine User Guide. The color of the point attachment as it was in Spine. Available only when nonessential data was exported. Point attachments are not usually rendered at runtime. An attachment that displays a textured quadrilateral. See Region attachments in the Spine User Guide. The color to tint the region attachment. The height of the region attachment in Spine. For each of the 4 vertices, a pair of x,y values that is the local position of the vertex. The width of the region attachment in Spine. Transforms the attachment's four vertices to world coordinates. worldVertices The output world vertices. Must have a length >= offset + 8.
offset The worldVertices index to begin writing values. stride The number of worldVertices entries between the value pairs written. Sets the normalized (0-1) texture coordinates of the left, top, right, and bottom edges of the texture region. rotate If true, the texture region is stored in the atlas rotated 90 degrees counterclockwise. Calculates the offset using the region settings. Must be called after changing region settings. Base class for an attachment with vertices that are transformed by one or more bones and can be deformed by a slot's attachmentVertices. start The index of the first vertices value to transform. Each vertex has 2 values, x and y.
count The number of world vertex values to output. Must be <= worldVerticesLength - start. worldVertices The output world vertices. Must have a length >= offset + count * stride / 2. The interface which can be implemented to customize creating and populating attachments. See Loading skeleton data in the Spine Runtimes Guide. <return value> May be null to not load the attachment. An AttachmentLoader that configures attachments using texture regions from an Atlas. Stores the setup pose for a Bone. The color of the bone as it was in Spine. Available only when nonessential data was exported. Bones are not usually rendered at runtime. The index of the bone in bones. The name of the bone, which is unique within the skeleton. The transform mode for how parent world transforms affect this bone. Stores a bone's current pose. A bone has a local transform which is used to compute its world transform. A bone also has an applied transform, which is a local transform that can be applied to compute the world transform. The local transform and applied transform may differ if a constraint or application code modifies the world transform after it was computed from the local transform. Part of the world transform matrix for the X axis. If changed, setAppliedValid should be set to false. The applied local x translation. The applied local y translation. Part of the world transform matrix for the Y axis. If changed, setAppliedValid should be set to false. The immediate children of this bone. The bone's setup pose data. The parent bone, or null if this is the root bone. The skeleton this bone belongs to. The world rotation for the X axis, calculated using a and c.
The world rotation for the Y axis, calculated using b and d.
The magnitude (always positive) of the world scale X, calculated using a and c.
The magnitude (always positive) of the world scale Y, calculated using b and d.
The world X position. If changed, setAppliedValid should be set to false. The world Y position. If changed, setAppliedValid should be set to false. If true, the applied transform matches the world transform. If false, the world transform has been modified since it was computed and updateAppliedTransform must be called before accessing the applied transform. Transforms a point from the bone's local coordinates to world coordinates. Transforms a local rotation to a world rotation. Rotates the world transform the specified amount and sets isAppliedValid to false. updateWorldTransform will need to be called on any child bones, recursively, and any constraints reapplied. Sets this bone's local transform to the setup pose. Computes the applied transform values from the world transform. This allows the applied transform to be accessed after the world transform has been modified (by a constraint, rotateWorld, etc). If updateWorldTransform has been called for a bone and isAppliedValid is false, then updateAppliedTransform must be called before accessing the applied transform. Some information is ambiguous in the world transform, such as -1,-1 scale versus 180 rotation. The applied transform after calling this method is equivalent to the local tranform used to compute the world transform, but may not be identical. Computes the world transform using the parent bone and the specified local transform. Child bones are not updated. Computes the world transform using the parent bone and this bone's local transform. Transforms a point from world coordinates to the bone's local coordinates. Transforms a world rotation to a local rotation. Determines how a bone inherits world transforms from parent bones. The interface for all constraints. The ordinal for the order a skeleton's constraints will be applied. Stores the setup pose for an IkConstraint. See IK constraints in the Spine User Guide. Controls the bend direction of the IK bones, either 1 or -1. The bones that are constrained by this IK constraint. When true and only a single bone is being constrained, if the target is too close, the bone is scaled to reach it. A percentage (0-1) that controls the mix between the constrained and unconstrained rotations. The IK constraint's name, which is unique within the skeleton. When true, if the target is out of range, the parent bone is scaled to reach it. If more than one bone is being constrained and the parent bone has local nonuniform scale, stretch is not applied. The bone that is the IK target. When true, only a single bone is being constrained, and compress or stretch is used, the bone is scaled on both the X and Y axes. Stores the current pose for an IK constraint. An IK constraint adjusts the rotation of 1 or 2 constrained bones so the tip of the last bone is as close to the target bone as possible. The bones that will be modified by this IK constraint. The IK constraint's setup pose data. Applies the constraint to the constrained bones. Applies 1 bone IK. The target is specified in the world coordinate system. Applies 2 bone IK. The target is specified in the world coordinate system. child A direct descendant of the parent bone. Stores the setup pose for a PathConstraint. See Path constraints in the Spine User Guide. The bones that will be modified by this path constraint. The path constraint's name, which is unique within the skeleton. An offset added to the constrained bone rotation. The position along the path. The mode for positioning the first bone on the path. The mode for adjusting the rotation of the bones. The mode for positioning the bones after the first bone on the path. The slot whose path attachment will be used to constrained the bones. A percentage (0-1) that controls the mix between the constrained and unconstrained translations. Stores the current pose for a path constraint. A path constraint adjusts the rotation, translation, and scale of the constrained bones so they follow a PathAttachment. The path constraint's setup pose data. Controls how the first bone is positioned along the path. See Position mode in the Spine User Guide. Controls how bones are rotated, translated, and scaled to match the path. See Rotate mode in the Spine User Guide. Controls how bones after the first bone are positioned along the path. See Spacing mode in the Spine User Guide. Stores the setup pose for a TransformConstraint. See Transform constraints in the Spine User Guide. The bones that will be modified by this transform constraint. The transform constraint's name, which is unique within the skeleton. An offset added to the constrained bone scaleX. An offset added to the constrained bone scaleY. An offset added to the constrained bone shearY. An offset added to the constrained bone X translation. An offset added to the constrained bone Y translation. A percentage (0-1) that controls the mix between the constrained and unconstrained scales. A percentage (0-1) that controls the mix between the constrained and unconstrained shears. The target bone whose world transform will be copied to the constrained bones. Stores the current pose for a transform constraint. A transform constraint adjusts the world transform of the constrained bones to match that of the target bone. The transform constraint's setup pose data. Stores the setup pose values for an Event. See Events in the Spine User Guide. The name of the event, which is unique within the skeleton. The event's string value or an empty string. Stores the current pose values for an Event. See Timeline apply, AnimationStateListener event, and Events in the Spine User Guide. The events's setup pose data. The animation time this event was keyed. Loads skeleton data in the Spine binary format. See Spine binary format and JSON and binary data in the Spine Runtimes Guide. Scales bone positions, image sizes, and translations as they are loaded. This allows different size images to be used at runtime than were used in Spine. See Scaling in the Spine Runtimes Guide. Deserializes the Spine binary data into a SkeletonData object. Collects each BoundingBoxAttachment that is visible and computes the world vertices for its polygon. The polygon vertices are provided along with convenience methods for doing hit detection. The height of the axis aligned bounding box. The right edge of the axis aligned bounding box. The top edge of the axis aligned bounding box. The left edge of the axis aligned bounding box. The bottom edge of the axis aligned bounding box. The world vertices for the bounding box polygons. The width of the axis aligned bounding box. Returns true if the axis aligned bounding box contains the point. Returns true if the axis aligned bounding box intersects the line segment. Returns true if the axis aligned bounding box intersects the axis aligned bounding box of the specified bounds. Returns true if the polygon contains the point. Returns the first bounding box attachment that contains the point, or null. When doing many checks, it is usually more efficient to only call this method if aabbContainsPoint returns true. Returns the polygon for the specified bounding box, or null. Returns true if the polygon contains any part of the line segment. Returns the first bounding box attachment that contains any part of the line segment, or null. When doing many checks, it is usually more efficient to only call this method if aabbIntersectsSegment returns true. Clears any previous polygons, finds all visible bounding box attachments, and computes the world vertices for each bounding box's polygon. updateAabb If true, the axis aligned bounding box containing all the polygons is computed. If false, the SkeletonBounds AABB methods will always return true. Stores the setup pose and all of the stateless data for a skeleton. 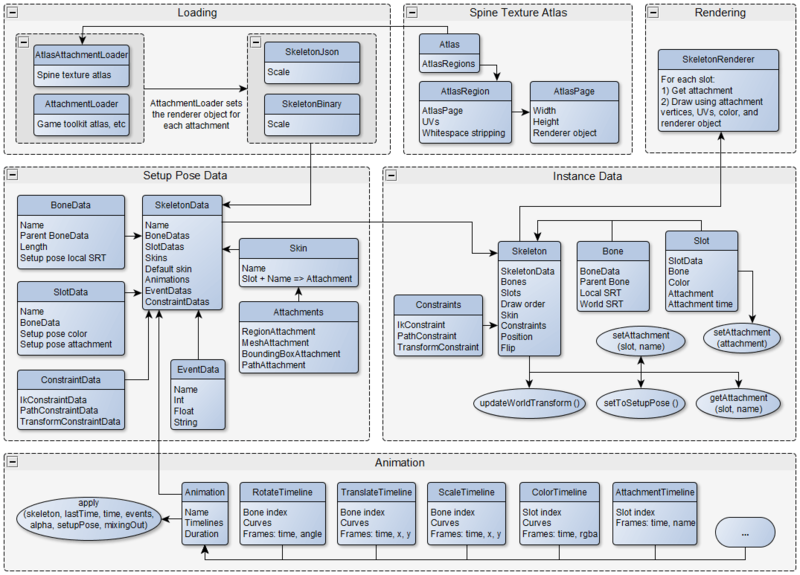 See Data objects in the Spine Runtimes Guide. The path to the audio directory as defined in Spine. Available only when nonessential data was exported. May be null. The skeleton's bones, sorted parent first. The root bone is always the first bone. The skeleton's default skin. By default this skin contains all attachments that were not in a skin in Spine. See getAttachment. May be null. The dopesheet FPS in Spine. Available only when nonessential data was exported. The skeleton data hash. This value will change if any of the skeleton data has changed. May be null. The height of the skeleton's axis aligned bounding box in the setup pose. The path to the images directory as defined in Spine. Available only when nonessential data was exported. May be null. The skeleton's name, which by default is the name of the skeleton data file, if possible. May be null. All skins, including the default skin. The Spine version used to export the skeleton data, or null. The width of the skeleton's axis aligned bounding box in the setup pose. Finds an animation by comparing each animation's name. It is more efficient to cache the results of this method than to call it multiple times. <return value> May be null. Finds a bone by comparing each bone's name. It is more efficient to cache the results of this method than to call it multiple times. Finds an event by comparing each events's name. It is more efficient to cache the results of this method than to call it multiple times. Finds an IK constraint by comparing each IK constraint's name. It is more efficient to cache the results of this method than to call it multiple times. Finds a path constraint by comparing each path constraint's name. It is more efficient to cache the results of this method than to call it multiple times. Finds a skin by comparing each skin's name. It is more efficient to cache the results of this method than to call it multiple times. Finds a slot by comparing each slot's name. It is more efficient to cache the results of this method than to call it multiple times. Finds a transform constraint by comparing each transform constraint's name. It is more efficient to cache the results of this method than to call it multiple times. Stores the current pose for a skeleton. See Instance objects in the Spine Runtimes Guide. The color to tint all the skeleton's attachments. The skeleton's setup pose data. The skeleton's slots in the order they should be drawn. The returned array may be modified to change the draw order. The root bone, or null. Scales the entire skeleton on the X axis. This affects all bones, even if the bone's transform mode disallows scale inheritance. Scales the entire skeleton on the Y axis. This affects all bones, even if the bone's transform mode disallows scale inheritance. The skeleton's current skin. May be null. The skeleton's time. This can be used for tracking, such as with Slot attachmentTime. Sets the skeleton X position, which is added to the root bone worldX position. Sets the skeleton Y position, which is added to the root bone worldY position. Finds an attachment by looking in the skin and defaultSkin using the slot index and attachment name. First the skin is checked and if the attachment was not found, the default skin is checked. See Runtime skins in the Spine Runtimes Guide. Finds an attachment by looking in the skin and defaultSkin using the slot name and attachment name. Returns the axis aligned bounding box (AABB) of the region and mesh attachments for the current pose. offset An output value, the distance from the skeleton origin to the bottom left corner of the AABB. size An output value, the width and height of the AABB. A convenience method to set an attachment by finding the slot with findSlot, finding the attachment with getAttachment, then setting the slot's attachment. attachmentName May be null to clear the slot. Sets the skin used to look up attachments before looking in the defaultSkin. Attachments from the new skin are attached if the corresponding attachment from the old skin was attached. If there was no old skin, each slot's setup mode attachment is attached from the new skin. After changing the skin, the visible attachments can be reset to those attached in the setup pose by calling setSlotsToSetupPose. Also, often apply is called before the next time the skeleton is rendered to allow any attachment keys in the current animation(s) to hide or show attachments from the new skin. Sets a skin by name. Sets the slots and draw order to their setup pose values. Sets the bones, constraints, slots, and draw order to their setup pose values. Updates the world transform for each bone and applies all constraints. The root bone will be temporarily parented to the specified bone. Updates the world transform for each bone and applies all constraints. Loads skeleton data in the Spine JSON format. See Spine JSON format and JSON and binary data in the Spine Runtimes Guide. Deserializes the Spine JSON data into a SkeletonData object. Stores attachments by slot index and attachment name. See SkeletonData defaultSkin, Skeleton skin, and Runtime skins in the Spine Runtimes Guide. The skin's name, which is unique within the skeleton. Adds an attachment to the skin for the specified slot index and name. Adds all attachments from the specified skin to this skin. Returns the attachment for the specified slot index and name, or null. Removes the attachment in the skin for the specified slot index and name, if any. Stores the setup pose for a Slot. The name of the attachment that is visible for this slot in the setup pose, or null if no attachment is visible. The blend mode for drawing the slot's attachment. The bone this slot belongs to. The color used to tint the slot's attachment. If darkColor is set, this is used as the light color for two color tinting. The dark color used to tint the slot's attachment for two color tinting, or null if two color tinting is not used. The dark color's alpha is not used. The index of the slot in slots. The name of the slot, which is unique within the skeleton. Determines how images are blended with existing pixels when drawn. Stores a slot's current pose. Slots organize attachments for drawOrder purposes and provide a place to store state for an attachment. State cannot be stored in an attachment itself because attachments are stateless and may be shared across multiple skeletons. The current attachment for the slot, or null if the slot has no attachment. The time that has elapsed since the last time the attachment was set or cleared. Relies on Skeleton time. Vertices to deform the slot's attachment. For an unweighted mesh, the entries are local positions for each vertex. For a weighted mesh, the entries are an offset for each vertex which will be added to the mesh's local vertex positions. The slot's setup pose data. The skeleton this slot belongs to. Sets this slot to the setup pose.